The history of ash in cheese making goes back hundreds of years to its use as a method to protect the surface of young cheese. As years passed, they later discovered it also greatly improved surface molds and how they grew on fresh cheeses for ripening. Traditionally this was ash from the burning of grape vine clippings in the Loire Valley of France. Today however the surface is normally covered with an activated charcoal mixed with salt. 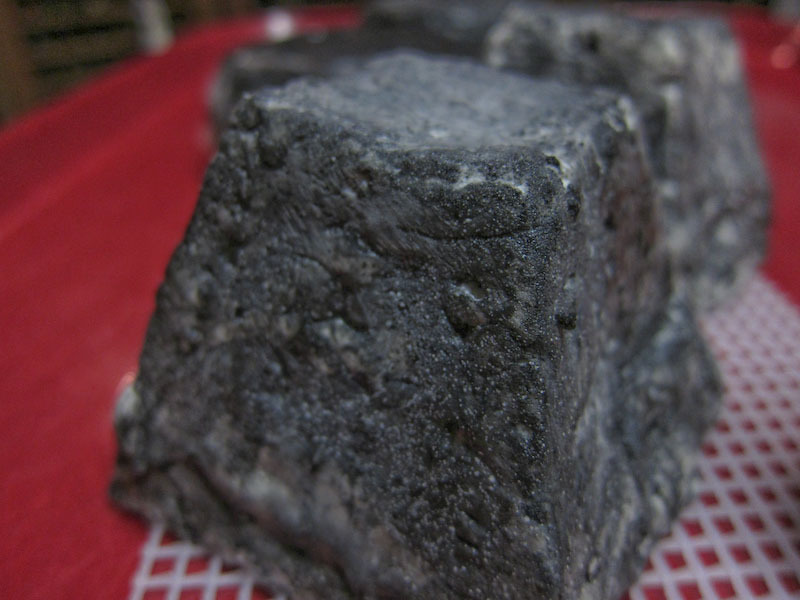 The cheese we will be making in this recipe is a lactic type goat's milk cheese with a covering of salt and fine powdered charcoal. As it ripens, it will change from dark grey/black to a beautiful blue-grey to white and bloomy surface. 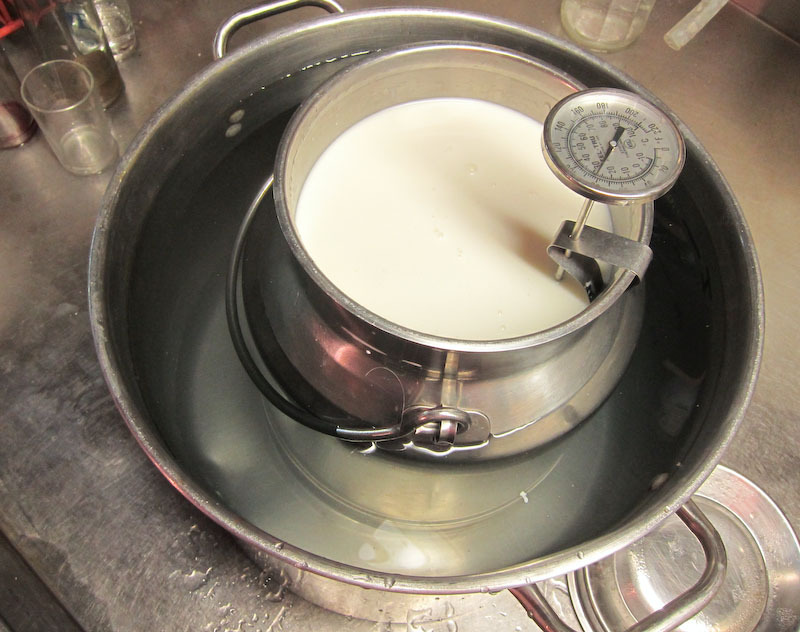 Begin by heating the milk to 68-72°F (20-22°C). If you do this in a pot on the stove make sure you heat the milk slowly and stir it well as it heats. 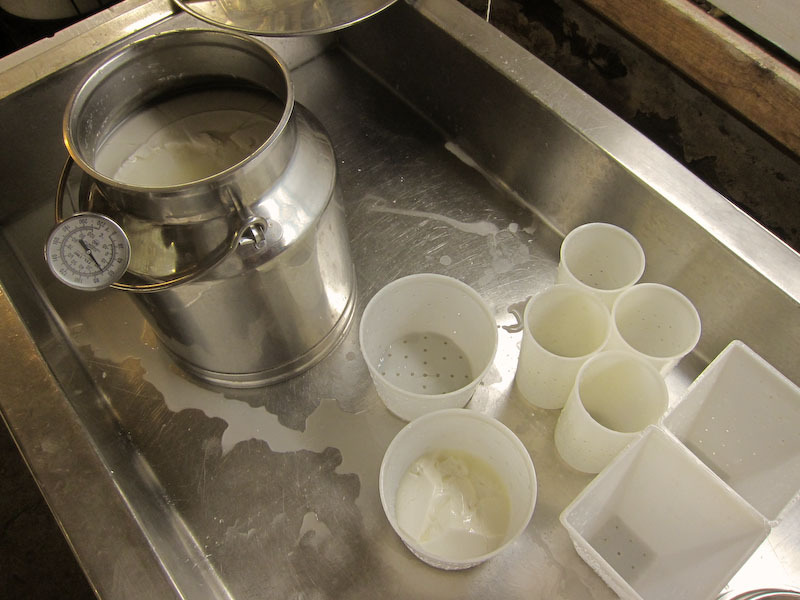 Once the milk is at the proper temperature, the Chevre and P. candidum culture can be added. To prevent the powder from caking and sinking in clumps, sprinkle the powder over the surface of the milk and then allow about 2 minutes for the powder to re-hydrate before stirring it in. Enough rennet is included with the culture to ensure a proper set. 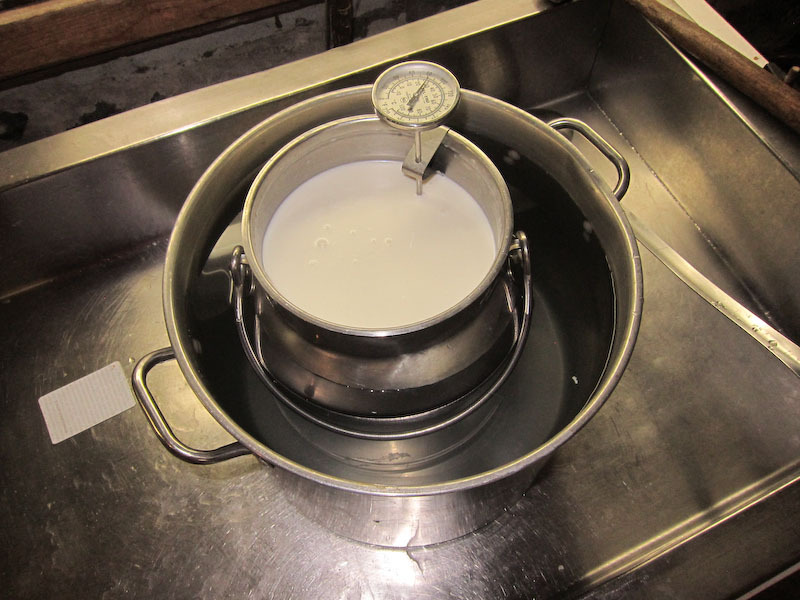 The milk now needs to set quietly for 18-24 hours while the culture works and the rennet coagulates the curd. 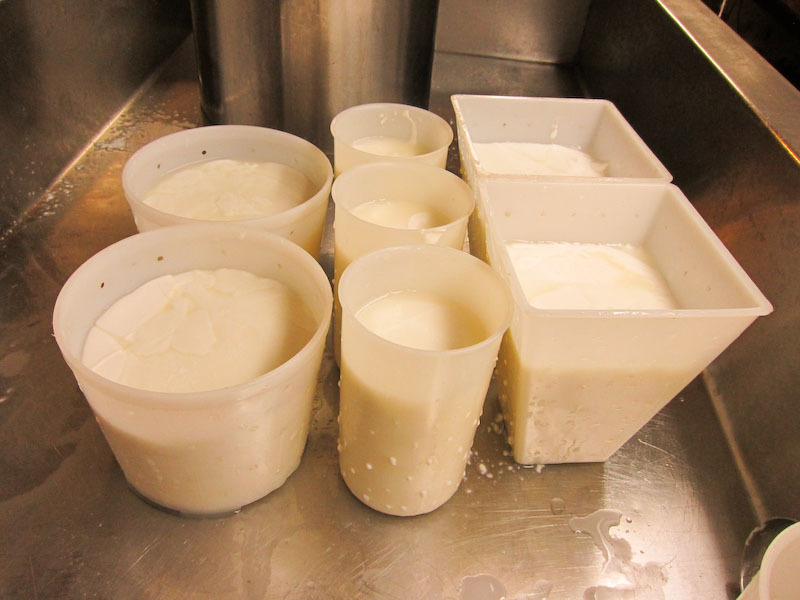 The thermal mass of this milk should keep it warm during this period since we are doing this at room temperature. It is OK if the temperature drops a few degrees during this time, but if your room is cold, it is essential to find a warmer space or to provide some additional insulation. 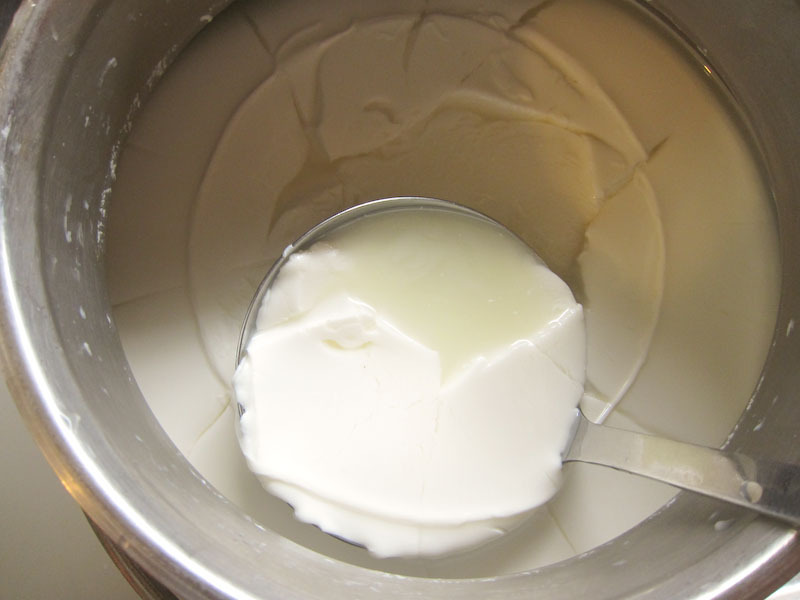 The longer the curd sets the more acid will be produced. 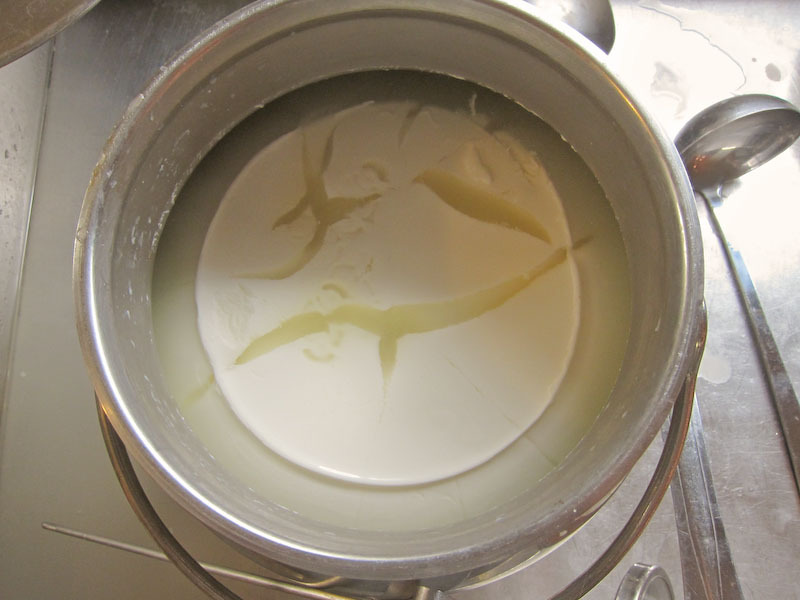 When a good curd has formed, you will see a thin layer of whey over the curd mass and the curd may show cracks and separation from the sides. It will also show a clean break when tested with a knife or finger. 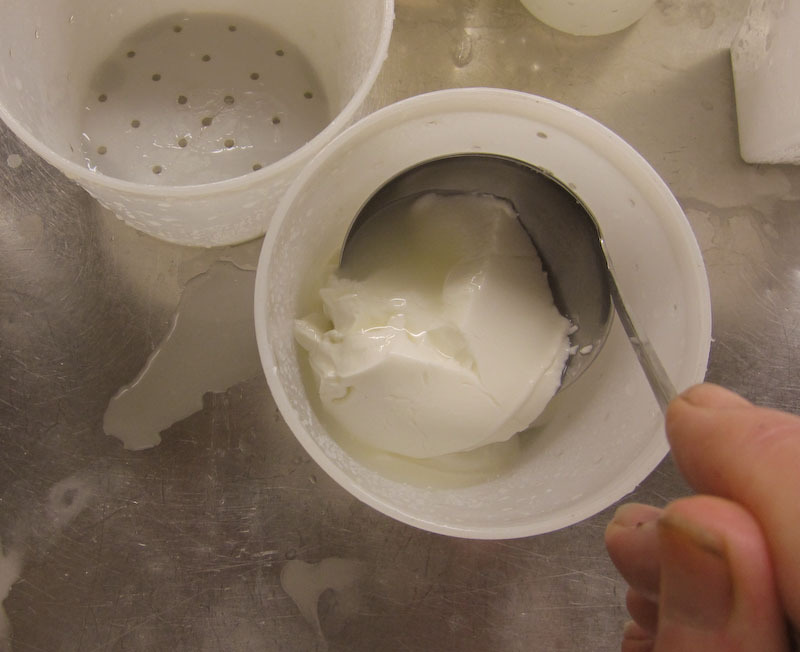 This curd can now be transferred to the molds with a small spoon or ladle to allow the whey to drain. The amount of time needed for draining will be about 8-20 hours at 68-72°F but this is dependent on what you want for moisture in your final cheese: less time for a sweeter and moister cheese, more time for a drier and tangier cheese. Remember that the bacteria is still working and as long as the whey is present it is able to convert the lactose (in the whey) to lactic acid. Note: You can also pre-drain these curds by ladling into a cloth lined colander and allowing them to drain for 4-6 hrs before transferring to the molds. This will eliminate the wait during direct curd transfer above while the curds drain in molds. For the cheeses I made in this recipe, I tried all kinds of variations in forms including the pyramid molds. I have also added an additional layer of ash about midway (just because it really looks neat). I simply dusted a thin layer of the charcoal with no salt (this can be messy) after filling the molds about 2/3rds full, then added the rest of the curds. The 2/3rds full line ends up at about the 1/2way point because of the settling and refilling seen below. When the molded cheese stops dripping whey it should be firm enough to carefully un-mold. The cheeses are now ready to be salted. The charcoal and salt are simply mixed together. 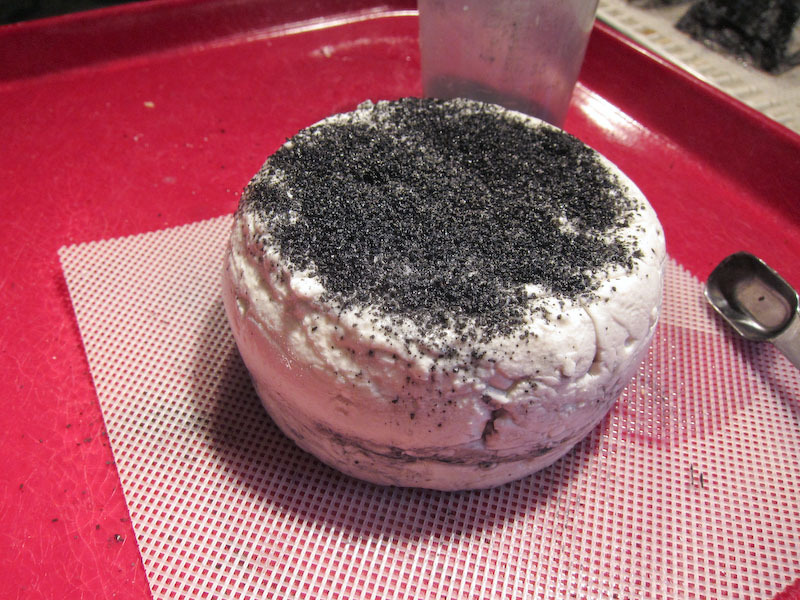 I use anywhere from a 1:5 to 1:8 charcoal to salt ratio, depending on how heavy an ash surface I want on the cheese. The base salt amount should be about 1 tsp per cheese and this is applied by sprinkling about 1/2 tsp per surface. This can be evened out with the hand and spread slightly down the sides (messy alert again). I usually wait until the salt dissolves and soaks into the cheese body leaving the black surface behind before turning and salting the other side. 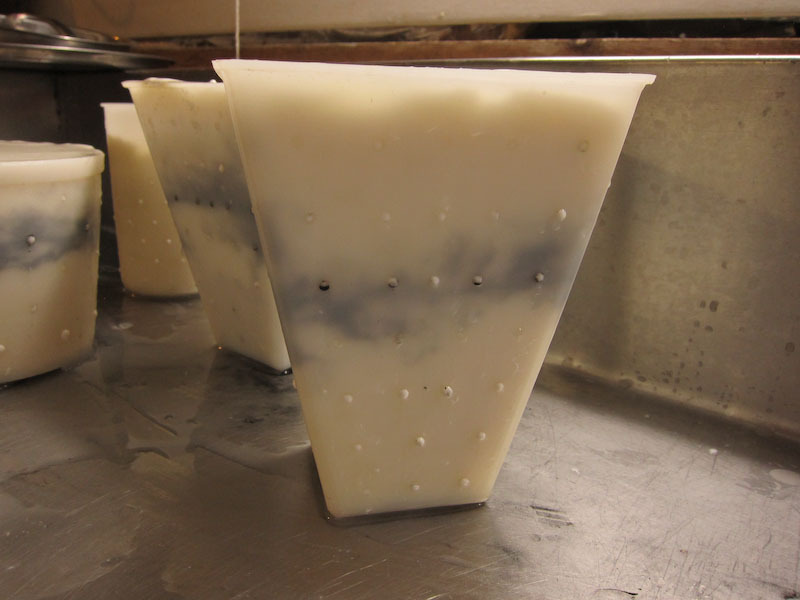 Next, when the salt has been absorbed and no whey drips from the cheese, they can be taken to a space for drying. What we are looking for here is the surface moisture to dry down so that no bright moisture spots can be felt or seen and the surface takes on a matte appearance. This is ideally done in a room at 60°F with 65-70% moisture. A plastic or reed mat should be placed under the cheese to allow air movement. Once the cheese is dry it can go to the aging space at 52-56°F and 90-95% moisture. Here it will undergo the final ripening, but must be turned daily to even the moisture and keep the mold from growing into the mats. The cheese surface seems to dry down a bit quicker than without. The mold develops much quicker than without. I find it shows up in about half the time. The cheese takes on a much more aromatic note. I associate it with the quicker development of the natural yeast population (ambient) and the more friendly P.candidum environment. It's a wonderful apple/pear with maybe a bit of sweet wine smell. At day 3, I am already seeing the first signs of the white mold as the surface changes from black to a dusky grey as seen in the photo on the right. By day 5 or 6, I am beginning to see a full coat develop as the surface becomes a lighter grey, as shown in the photo to the left. This is a surface I normally find growing at day 10-14 when not using the charcoal. By day 8-12 the cheese is ready to cut as fresh but can be held for several weeks as the surface enzymes continue to work on the proteins, leading to more complexity in flavor. 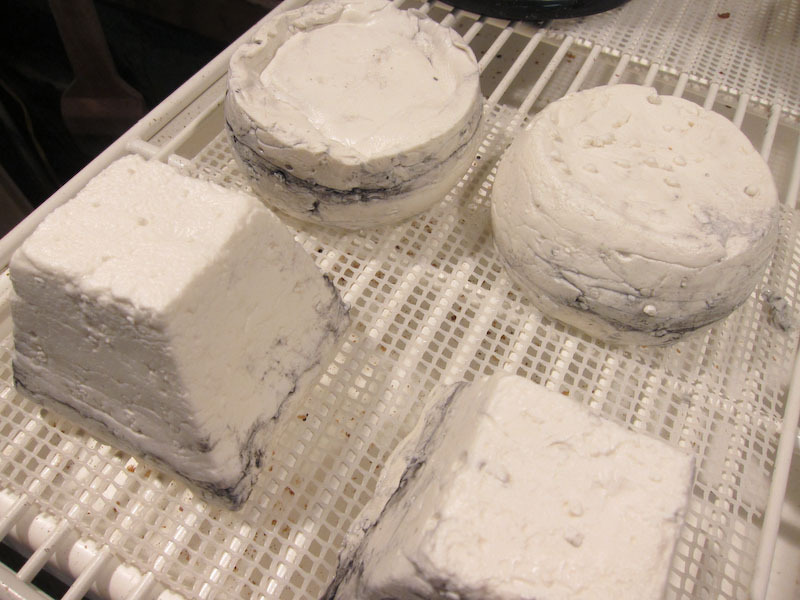 In a recent workshop I decided to add the ash to my traditional Camembert to see how it progressed. This is not a lactic cheese but a rennet coagulated cheese and made with a rich cow's milk rather than goat's milk. The milk I use for this is a full fat Jersey milk and has a very high fat content of about 5-5.2% that gets fully incorporated into this cheese. Since the fat tends to hold more moisture, I have always had difficulty drying the cheese down due to the tendency of butterfat to hold moisture. My thoughts were that the charcoal would dry the surface more and that is exactly what I'm experiencing so far. The result has been a much cleaner and quicker growing surface with a very different and truly amazing aroma during the early ripening. I am really hoping this carries through to the finished cheese. The history of ash in cheese making goes back hundreds of years to its use as a method to protect the surface of young cheese. As years passed, they later discovered that it also greatly improved the surface molds and how they grew on fresh cheeses for ripening. In earlier times, this was ash from the burning of the grape vine clippings in the Loire Valley of France which was even then noted for their wealth of fresh goat cheese. 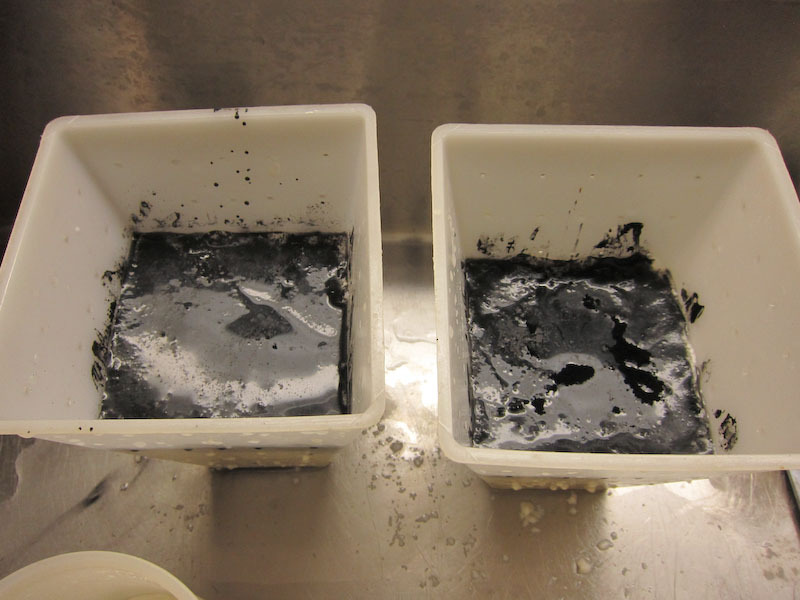 Today, however, the surface is normally covered with an activated charcoal mixed with salt. Many folks may look at this ash/charcoal addition and say: "I am not interested in eating dirt with my cheese." Well, the reality is that this is not barbeque charcoal and it is not a gritty ash. It is a finely powdered, food grade component actually revered by the medical world for its ability to control and absorb toxins. Currently, smoke, ash, and fire components are the rage in culinary circles and should also lead to some great additions in cheese making. As long as the ash/charcoal is not overdone, it will really enhance the cheese and many folks will not even notice the difference in taste. They will, however, have no clue as to how it has improved the development of the cheese. They may simply pop in with "Wow! This is much better than before. What did you do different?" I can also imagine incorporating a little bit of smoke to the ash for a subtle kicker. Your imagination should be your only limitation with this new tool of ash and charcoal in your cheese making chest. Since the beginning of cheese making, the preservation of the fresh cheese surface has always been the next major concern after the cheese has left the brine bath or dry salt table. This wonderful rich and aromatic surface has always been just as attractive to the ever-present microbes and mold spores as it has been to us and hence, the race begins. 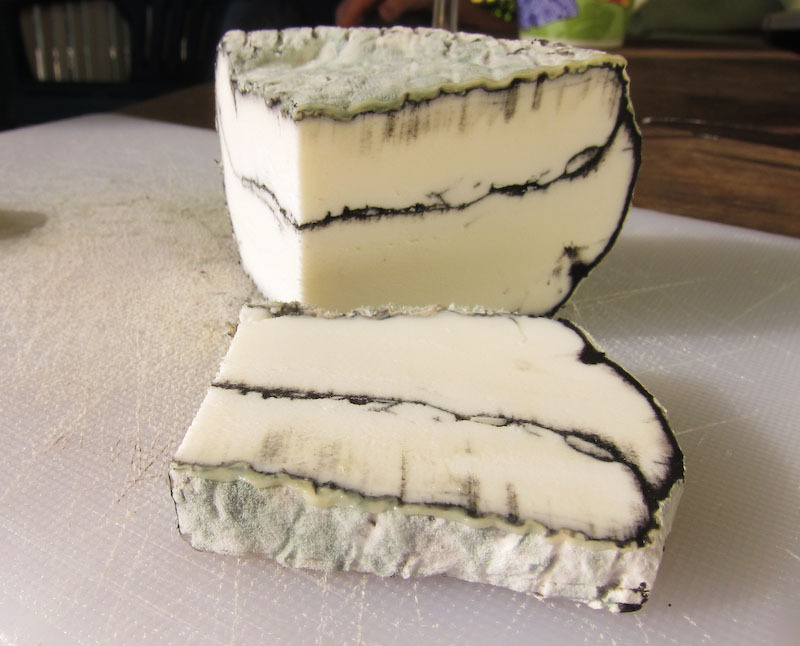 How do we keep the cheese surface in good condition until the cheese has aged enough for the table, whether this was a few days or a few months? Before the invention of the wax or plastic coat and definitely before the present permeable plastic wraps of today, there were far fewer options. Initially, it was common to just let it go au naturale and accept whatever ambient growth took place, but at times this became a bit too coarse for even the most basic cheese. Then, at some point long ago, someone had the bright idea of coating the surface with the fine grey ash that was readily available from burnings. This seemed to preserve the cheese by discouraging the flying hoards and the "floaties" from settling and setting up housekeeping on the surface of their cheeses. It also soon became apparent that the ash tended to dry off the surface as well, making it less habitable for the uninvited. 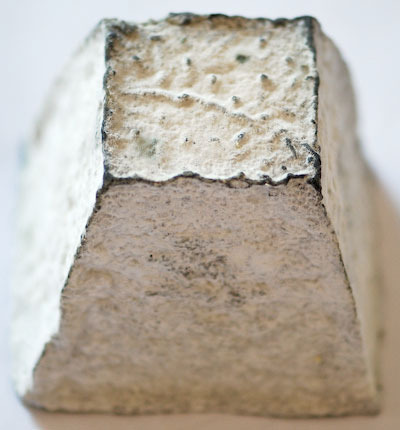 As more time passed, other variations have developed such as the Italian cheese Sottocennere (under the ash) which is buried in a grey ash inside large terra cotta clay pots and aged for months. 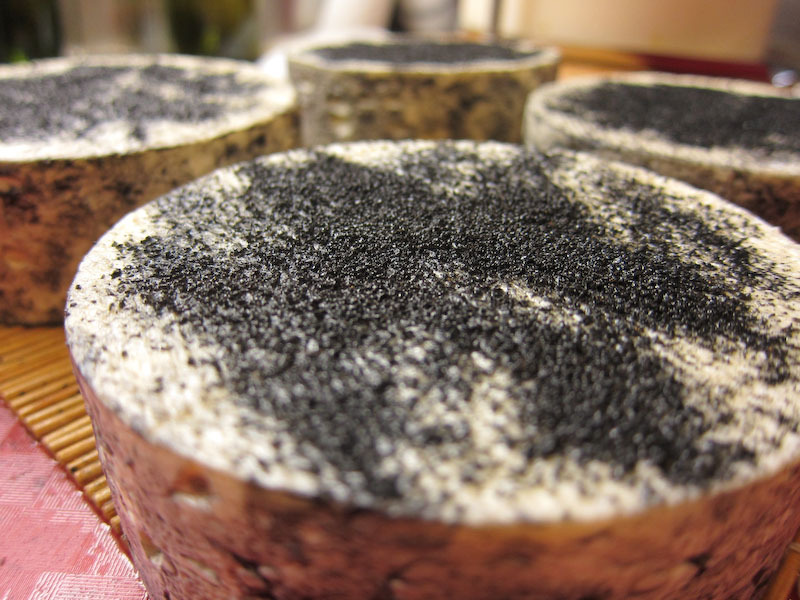 In France, the Selles sur Cher is another fine example of a young cheese ripened with a layer of ash. 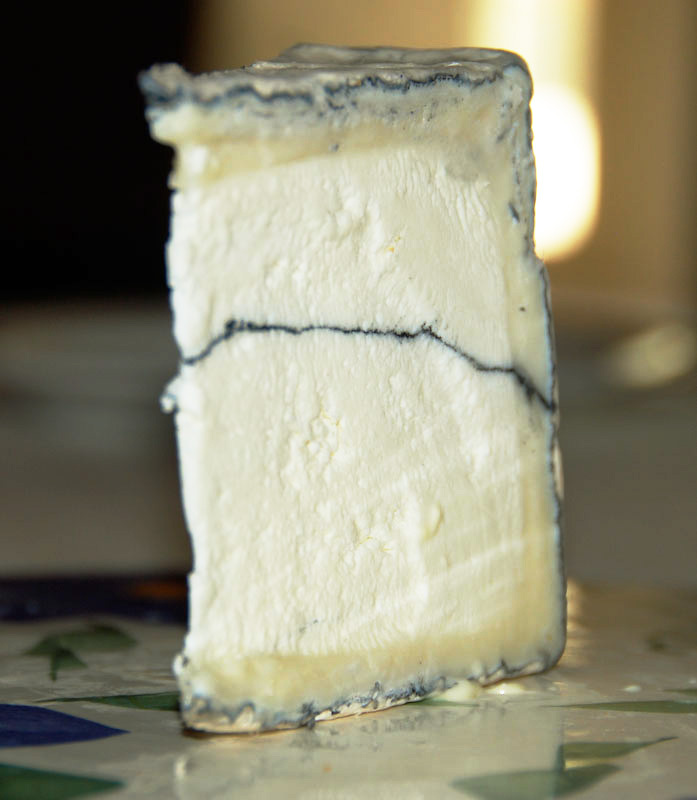 Another example is the Morbier cheese from France with a distinctive black line running through the center of the cheese. The story behind this cheese stems from a time when varying milk sources left cheese makers with half filled molds until the next milking. The problem here was the drying of this surface and the problem with flies and other particulates landing on the surface. The solution was a hand dipped in whey and then rubbed on the surface of the wood fired and heavily carboned vats and transferring this to the surface of the cheese. 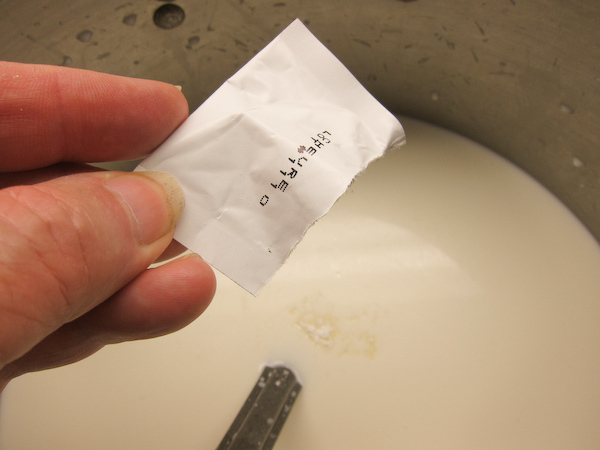 When the next cheese was made, the new curds were added leaving this distinctive black line through the cheese center. In the commercial version today this is simply a matter of the traditional appearance. It serves no functional purpose. 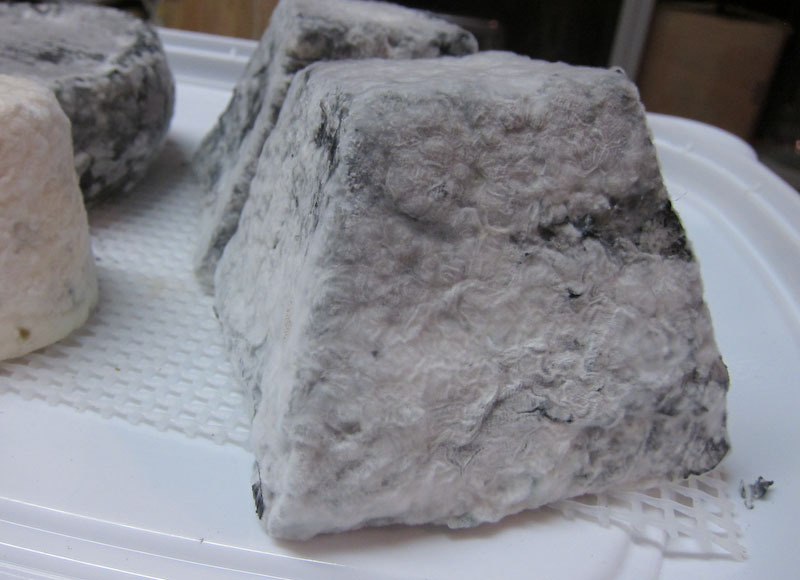 If you have seen ash covered cheese already, it may have been a goat's milk cheese because most of them are. Why goat's milk? The primary reason for this is that these cheeses are most often lactic in nature and therefore they have very soft surfaces and very weak bodies. 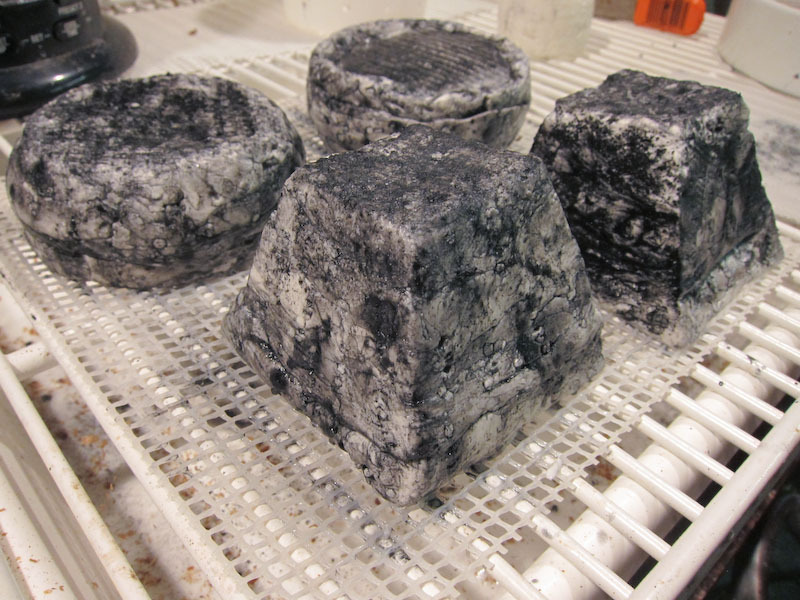 Certain surface treatments such as rubbing, brushing and oiling as used on firmer natural rind cheeses will not do well with these fragile surfaces. 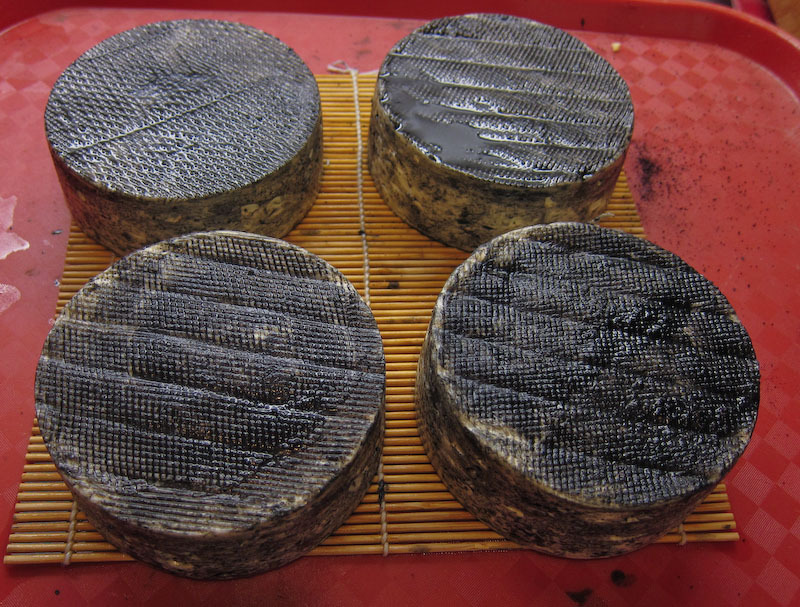 Therefore, a common treatment for these rinds was to develop a natural mold cover. 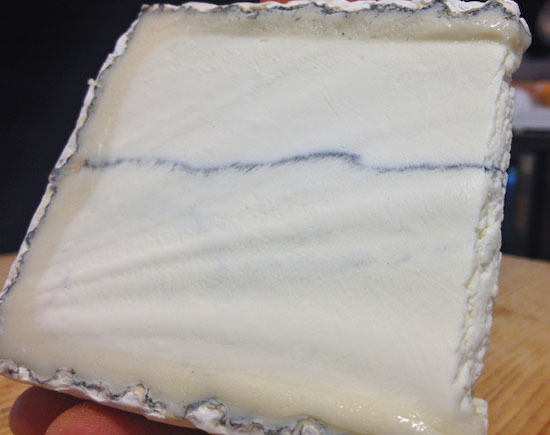 This could be either a natural mixed mold rind or, for more aesthetic presentation, the bloomy white rinds. 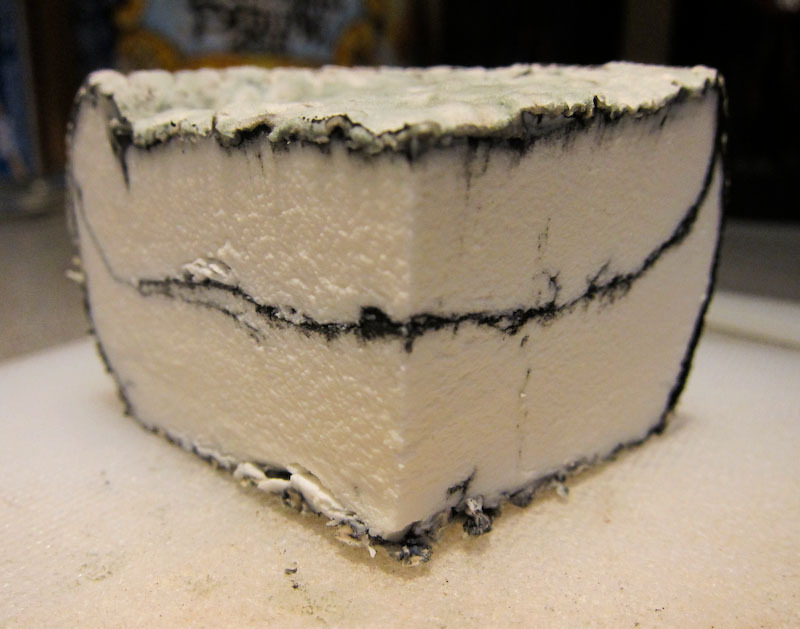 Since this style of lactic cheese develops a high level of acid and the white mold is slow to grow with this, the ash or charcoal was added to reduce the acid as will be explained below, thus allowing the mold to grow quicker and more evenly to begin the ripening process. Usually this is done by adding salt to the charcoal or ash and applying this after the cheese is well drained. 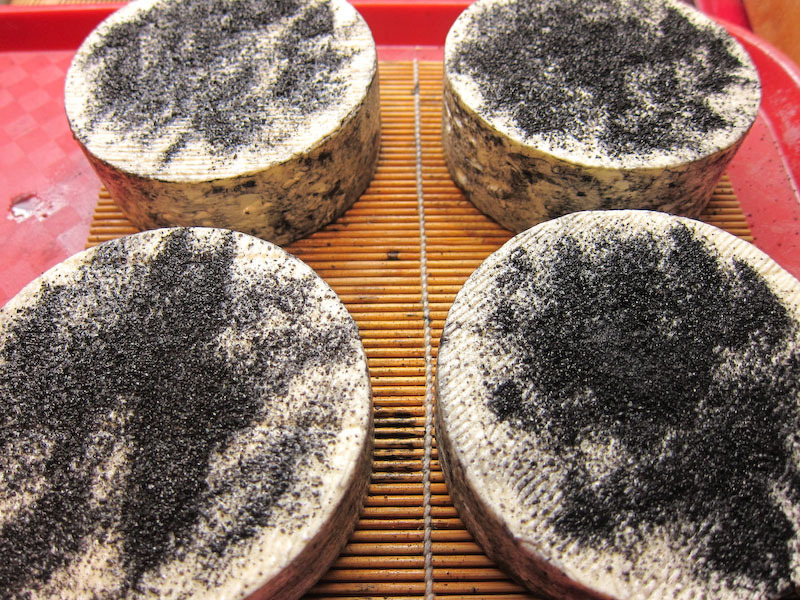 In addition, the use of the ash with goat's milk provides a very aesthetic and unique presentation with the snow white milk contrasting with the black lines around the surface or through the center. ASH --When wood or any other vegetable matter (mostly cellulose) is burned in open air, all that remains is a fine grey particulate which is largely comprised of an alkaline (high pH) salt. This is a true ash. CHARCOAL -- When it is burned with a limited air supply we have charcoal which is mostly carbon along with some of the alkaline salts. In addition, the charcoal structure is a solid with many small pores in its structure. These small pores are capable of absorption or collecting unwanted components such as contaminates from air and water. 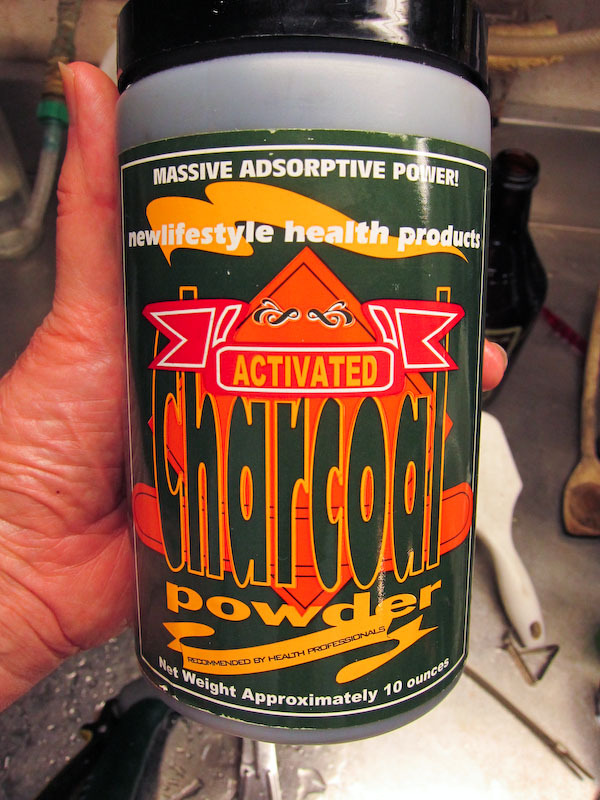 ACTIVATED CHARCOAL -- If the charcoal undergoes special treatment (heat, chemical etc.) 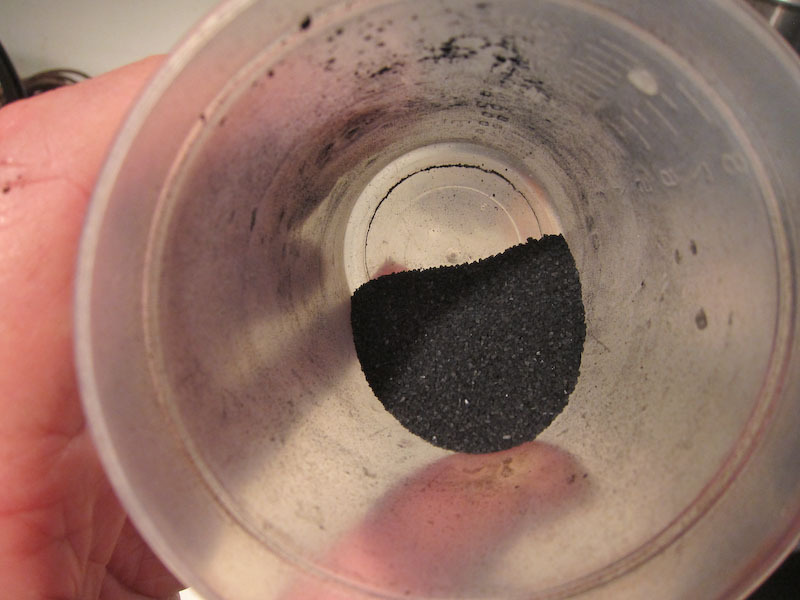 it can become Activated Charcoal or Super Charcoal. This will contain much finer micropores and therefore its ability to absorb will be much greater. the surface acidity will be neutralized by the alkaline salt. 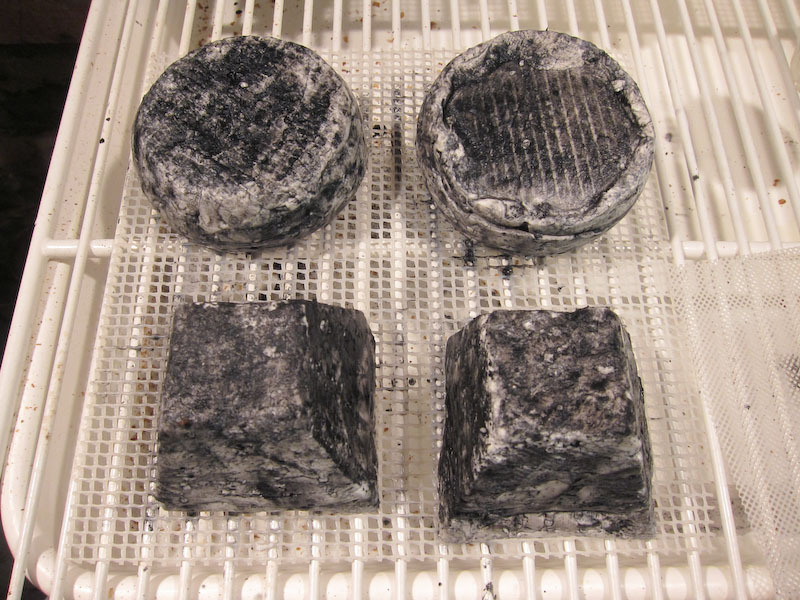 In both cases, the cheese surface becomes less acid and this creates a more attractive surface for molds such as P. candidum (the white mold of Camembert) to develop more quickly. This also dries the surface a bit and keeps the rate of mold activity from becoming excessive. The most effective of these products is the activated charcoal because it does more of the absorption than either charcoal or a simple ash. Like for one of the other reviewers, this was my first foray into cultured, mold-ripened cheeses. I could not have been happier and prouder of the result! The recipe is very easy to follow, full of lots of helpful advice, and the photos are also very helpful. I was expecting difficulties, but it all went so smoothly. I felt like a pro. And the resulting cheese not only looks great; it is also simply delicious. This cheese needs a good name! 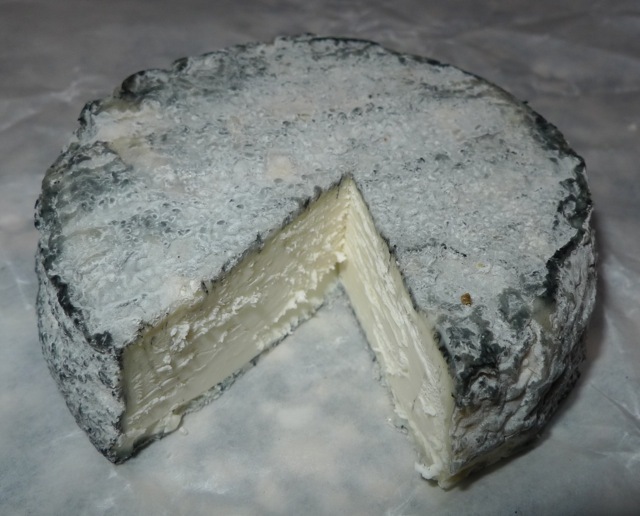 It's not quite like a St. Maure -- it has a denser, firmer texture, and that lovely, velvety mold-rind from the p. candidum, similar to that with a Brie or Camembert. 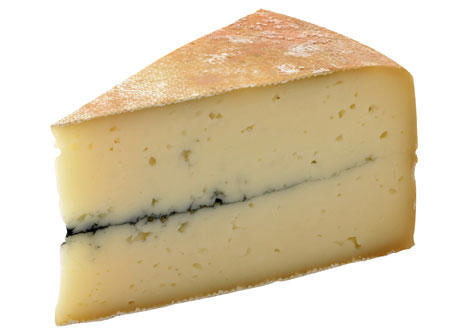 And it tastes fabulous--mild but with a noticeable tang, firm but still slightly creamy, and a nice, earthy rind. I've already started my second batch. Thank you so much for this recipe! 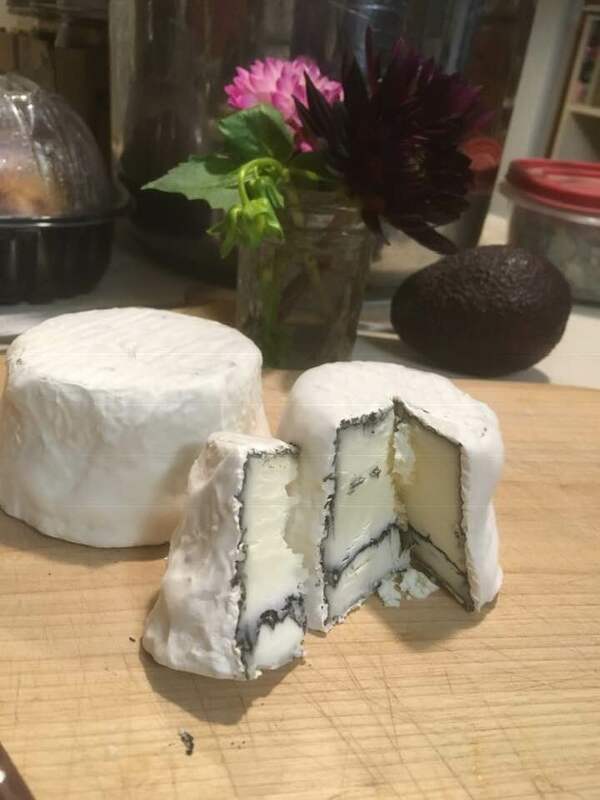 This was the very first molded cheese that I ever attempted and I had amazing results. The instructions are very clear and easy to follow. I used the pyramid molds and added the line of ash in the middle. One word of advice--if using the pyramid molds, they are quite unstable so make sure you put them inside a larger mold or pot to stabilize them! Even though we had a domino-effect spilling accident, it still turned out beautiful and delicious (and the mixing of the curds during the tipping gave the ash and curds a beautiful marble look!). 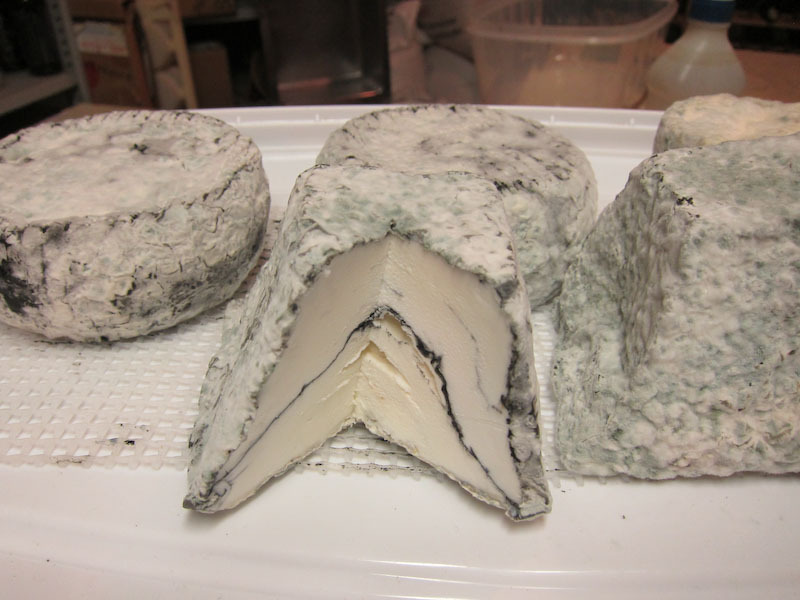 Nixe and tangy with a mild brie-like funkiness from the surface mold. I am making this again today! Friends and family were quite impressed that a novice cheesemaker could make something that looked so fancy! Fab & Different Goat Cheese! I've made a few chevres in the past, but not with the p. candidum or ash. So, this was a fun & different experience for me. I used the large pyramid-type mold and a homemade activated charcoal. I am so pleased with this recipe, and you can let it age to your liking. I find I like it a little "brie-ish" on the outside and less ripe in the center. If you can find a good deal on goat milk in your area (or you own a goat or two), I do recommend trying this one out. A homemade version is a fantastic value and so rewarding.